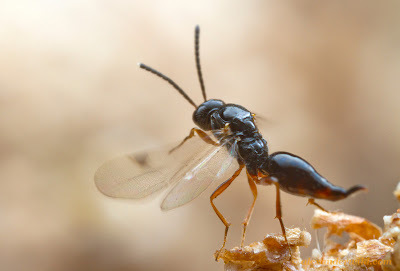 At left, a small parasitic wasp (Brachyserphus sp.) launches herself into the air. This species attacks nitidulid beetles, and the photograph is again a wonderful shot by entomologist and photographer extraordinaire, Alexander Wild (as before, go to http://www.alexanderwild.com for more awesome shots). One thing that you may note, if you are feeling observant, is that the wings are just coming down as the walking limbs are completing their push off of the substrate. This seems to be a rather general trend - the legs are used to initiate launch and the wings engage relatively late in the launch cycle (Nachtigall and Wilson, 1967; Nachtigall, 1968; 1978; Schouest et al., 1986; Trimarchi and Schneiderman, 1993; 1995). A "leap first, flap second" modality is also seen in vertebrates, and the generality of the trend in flying animals probably derives from the fact that pushing off the substrate provides much greater efficiency in achieving high accelerations from rest than would be accomplished by first engaging the wings. It is also worth noting that slow flight, which would include the first moments after takeoff, typically requires greater wingstroke amplitudes than fast flight - so clearance for the wings can be a problem for a launching animal. The easiest solution is simply to jump first, fly second.